Acey had what most mums would call a perfect pregnancy until around 32 weeks when she started displaying symptoms that would mark the start of a very difficult journey for her family. “My stomach started to get excessively large very quickly making even the simplest of tasks difficult; even sleeping was near impossible. At my next midlife appointment, they said I had three litres of excess fluid which needed to be withdrawn,” explains Acey. Whilst undergoing the procedure, Acey, who suffers from sickle cell anaemia, had an abnormal reaction. “She was in excruciating pain, had a ridiculously high temperature and the doctors told us they needed to perform an emergency caesarean,” says dad Salim. It was shortly after the C-section they were told all was not right with their baby boy, Kenzo-Sion. 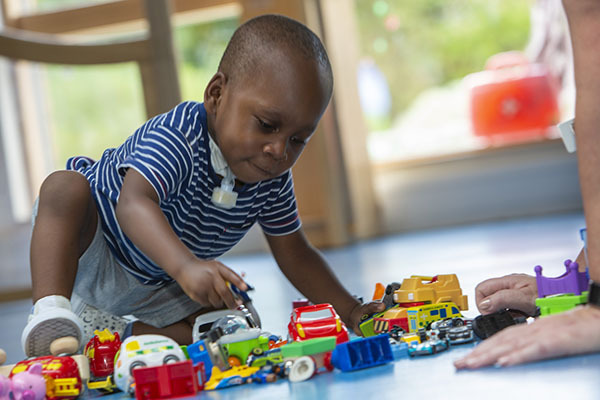 Kenzo-Sion was born with a condition called tracheoesophageal fistula – meaning he had an abnormal connection between his oesophagus and trachea. Had he swallowed it would have gone straight to his lungs, instead of his stomach. “My heart sank, as I realised all hadn’t been right during my pregnancy and this explained why I was carrying so much excess fluid,” said Acey. On the second day of his life, Kenzo-Sion was whisked off to St Thomas’ Hospital for an emergency operation. Acey remained in Queens Hospital in a coma, leaving Salim going back and forth between hospitals to support them both. Despite a number of set backs and several additional operations, Kenzo-Sion was eventually able to go home. However, just three weeks later, his condition deteriorated and he went into cardiac arrest. Back in hospital, he was then diagnosed with tracheomalacia, a condition where the cartilage in the windpipe hasn’t developed properly. After numerous surgical alternatives, it was decided that he needed a tracheostomy where a tube is inserted into the windpipe to assist with breathing via a ventilator. Intensive training is needed to care for a child with a tracheostomy and the couple went through months of tuition before Kenzo-Sion could go home. “It’s a completely different kind of care; you can’t comprehend or understand the level of work needed until you have to do it. The feeling of ‘public parenting’ at the hospital then followed us home. It wasn’t our home – it was Kenzo-Sion’s care home,” explains Salim. “Salim and I are the only two trained to look after Kenzo-Sion in our family, none of whom are local to us. They were of course all there at the beginning, but it’s too much for everyone to keep up living so far away,” said Acey. “We never had anyone that could help with looking after our son, not even for a couple of hours as his care is so complex, until Shooting Star Chase came along. We are so thankful for them.” Kenzo-Sion has short breaks at Shooting Star House in Hampton. “I think of the place and staff like extended family that are fully trained,” said Salim. “It’s just been a godsend, especially with my surgery as well,” said Acey. Following a fall from the hospital bed, shortly after coming out of the coma, Acey hurt her hip and suffered excruciating pain for over a year. It was discovered that she had developed avascular necrosis – bone death in the hip joint. Acey had to have hip replacement surgery and is due to have her other hip replaced soon.“Knowing Kenzo-Sion is somewhere safe whilst I’m having my operation and recovering is such peace of mind,” says Acey. “Shooting Star Chase play a very supportive role. That’s what it comes down to: they’re there for us whenever we need them. We couldn’t have done it without them,” says Salim. “When Kenzo-Sion had his first short break it was a weight lifted just to have those few days. His care is 24/7, especially when he was first came home, as he was fully ventilated 24 hours a day and fed through a PEG.” A PEG is a tube inserted into the stomach to help with feeding. Now two and a half years old, Kenzo-Sion is doing well and loves his visits to Shooting Star House. “He loves everyone and likes making friends. We are so proud of him, he’s such a happy and sociable little boy,” says Acey.